If you've never experienced the fun...the excitement...and the sheer pleasure of the Wisconsin Dells...you're missing the vacation of a lifetime. No other place boasts more waterparks than the Dells, large and small, indoor and outdoor. Combined with terrific recreation, festivals, theaters, and museums, there's something for everyone at Wisconsin Dells. The "Dalles" region of the Wisconsin River was one of the oldest points of reference around the Great Lakes. After the French left the area, the name stuck but the pronunciation was changed to "Dells." Originally named Kilbourn City, it officially changed its name in 1931 to Wisconsin Dells. 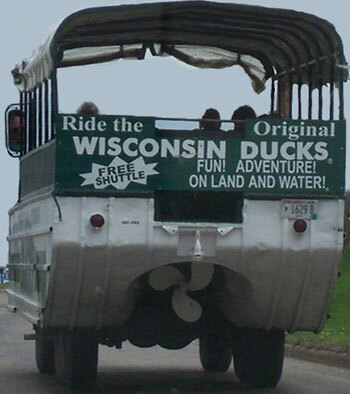 It is one of the oldest resort areas in the state, and really got its start when "ducks" were introduced to the Dells. Ducks, army surplus land and water vehicles, were brought to Lake Delton in 1946 and began giving tourists rides on Mirror Lake and surrounding waters. The Wisconsin Dells really became popular with vacationers after the Tommy Bartlett Water Ski Shows started in the 1950s. Thousands visit the Dells every year and keep coming back. It doesn't matter what your age...waterparks are fun for everyone! Wisconsin Dells is known as the "Waterpark Capital of the World," and you'll find the right one to suit your needs. There are at least 24 outdoor waterparks, ranging from REALLY big ones to smaller parks within resorts. And don't think you can't have fun in the winter....Wisconsin Dells also has indoor waterparks that you can enjoy all year. There are over 20 parks and water playgrounds in the area, offering more fun than you can imagine. Start your vacation the right way by hitting the water. There are numerous watercraft to choose from as you experience the Dells. Climb aboard a Duck or Riverboat...take an exciting jet boat, or relax on a romantic sunset cruise. Whatever you choose, it will be the highlight of your trip. Also in the summer you can play a round of golf, visit a zoo or horse stable, and spend the day at an amusement park. During the winter months, there are spas, comedy clubs, Circus World, Tommy Barlett Exploratory, the Rick Wilcox Magic Theater, and Ripley's Believe it or Not. The fun never ends at Wisconsin Dells. Go to Dells.com or WisDells.com for more information. It's a very short drive between the many charming communities in our area, including Manitowoc, Green Bay and Door County.